Caterpillar reported a sharp drop in sales to its worldwide network of dealers Wednesday, sparking a sell-off in its stock and raising worries of a global slowdown for the construction industry. 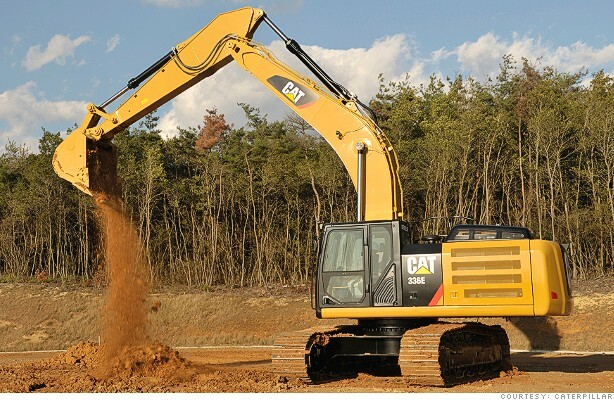 Shares of Caterpillar (CAT), which makes heavy construction equipment, dropped nearly 2%, even as the Dow Jones industrial average hit a new intraday record high. In fact, Caterpillar was the only Dow component in the red for much of the day. Caterpillar's move, along with bad news from Federal Express (FDX, prompted traders on StockTwits to raise questions about cracks in the economy. FedEx offered its own warnings about a potentially slowing global economy when it reported a steep drop in earnings and said that shipments in and out of Asia fell. Its stock dropped nearly 6% Wednesday. Investors will have to wait until April 22 for Caterpillar's first-quarter results, but the initial signs aren't very positive. Not sure I'd go so far as to say China is in bad shape. China set a GDP growth target of 7.5% for the year. That's the same target it had last year, when GDP rose 7.8%. But good point on copper. Prices have been rising, which could signal some overheating in the property market. Still, it may be too soon to start calling a hard landing. $CAT got your tongue? Caterpillar down 1.4% today and 3% YTD. Worst Dow performer. Global equipment sales by dealers fell hard in February.